When one is a Billionaire, one can say whatever one wants and try to pass it as wisdom or gospel truth. Let us examine these words of Avuncular Warren a little closer. First, as Mr Buffett has rightly noted, there were no index funds back in 1942. What is unsaid and absolutely critical is that the first index fund was not around until the 1970's. So an investor would have needed all the sophistication to track the key stocks by market value, assign/reassign weights, balance/re-balance the portfolio and all that jazz that an index fund or an ETF does these days. Remember, at its 50th anniversary of formation, the S&P500 had just about 80 odd of the original 500, and the 400+ companies had either gone bankrupt, been taken over or dropped off the index. So for 30 years! Was a normal investor expected to do that? How do you think that would have gone? Marquee Company's like Sears, Lehman, Radio Shack which were on the index for 50+ years went bust. Bear in mind, that when an investor looses 10% he/she needs 11.2% to break-even, 25% loss needs 33% to break-even and so on. What is a Dollar then? The US Congress describes the Dollar as 1/44.22 an ounce of Gold. That is if you pay $44.22 you can get an ounce or 28.35 gms of gold OR 1kg of gold for $1,560!! Compare that to actual value of 1kg of gold as on date - $ 42,346!! It is exactly this kind of dilution and dishonesty that Gold stands to protect. And it has. An ounce of gold will fetch a fine Louis Vitton or Hugo Boss suit. 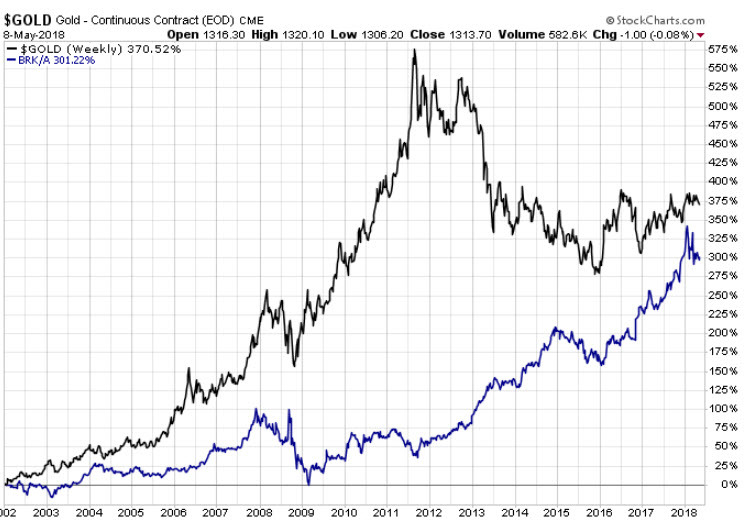 Finally, here is a chart of Gold's performance vs Berkshire Hathway since 2002. In 2012, gold was crushing the performance of BRK by 420%. Also one can see, Gold is still delivering 70% better returns than BRK since 2002, even after a steep drop from record highs. Buffett's BRK has completely missed the commodity boom. Hence, maybe he has a reputation guard? Also, Berkshire has a cash reserve of over $100Bln. This reserve needs to go into something productive otherwise this poses a big problem for Buffett, especially if the dollar is going to loose value in the future. 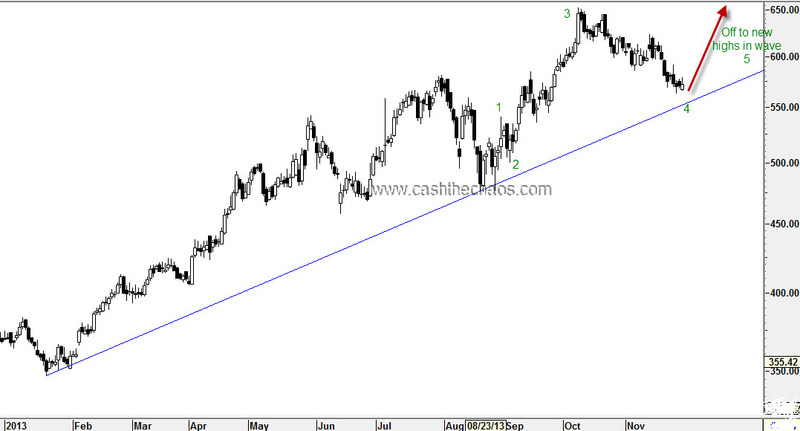 Dr Reddy's seems to have completed an A-B-C correction and looks set for a new 52 week high. The elliott wave labels are shown on the chart below. If you connect the lows from Feb 2013, there is a trendline running through the recent low of 2540. Hence, it makes sense to go long at current levels of 2633 with a daily closing stop below 2540 and expect the stock to scale 2905-3000. Please bear in mind that in the longer term time frame, we are in the fifth wave. Hence, one should not get aggressive on the long side. Also fifth waves tend to be slower than 3rd wave - something options traders need to be mindful (you may not want time decay eroding your premium despite being right). Note: If you are a pay-per-view customer, remember to save this post as pdf. Legal Disclaimer: This post gives an idea of how a trader chooses low risk entry points for trading and hence what you see in this post is for educational purpose only. This is no solicitation to buy, sell or hold any securities. I’m not a registered investment advisor and I strongly urge you to consult one if you are going to act on the above idea. If you decide to take action on the above idea, you are agreeing that you take full responsibility for the profit or loss that you may sustain based on such decisions and agreeing to indemnify the author of the same. You may have seen me on TV suggesting successful trade ideas but remember trading is inherently risky and past performance is no guarantee of future outcome. NOTE: This was a premium content and has been unlocked now. The trade got stopped out at 2520 on 14th May after reaching 2780 on 30th April. Reliance capital (last -333.8) has clocked a 5 up- 3down price action since its lows in Aug 2013. This is a classic bullish set up under the wave principle. The stock could be at the beginning stages of a huge bullish price move or a large corrective rise. In either case, one may expect a minimum rally to Rs.380. Traders may use Rs.304 at a daily closing level as a stop loss and may use dips to go long in this counter. The GBPINR cross may have established a base around 100 and seems set to move higher. A small star pattern followed by a bullish candle (similar to a morning star pattern) indicates that higher prices lie ahead. The zig-zag price movements are in harmonic ratios. This is shown in the chart below. If the cross-rates sustains above 101.82 for an hour, traders may consider going long for an initial target of 103.8 and then 106.3. Use 100.8 at a daily closing level as stop. Note: This was a premium post and has now been unlocked. Trade did not trigger as it did not sustain above 101.82 for an hour. It is always a good idea to start from a very significant market turn to get a clear picture of how a market is poised at its current juncture. Hence, we take a look at Bank Nifty from its 2009 low. After a close analysis of the weekly charts of Bank Nifty from an Elliott Wave perspective, we are able to label the move from the 2009 low to the 2013 high as a completed 5 wave move. The wave principle tells us that once a 5 wave move is complete, we should look for a 3 wave corrective move against previous trend. This 3 wave move is labeled as an a b c (in circle). Most often this entire corrective wave ends near the previous fourth wave. The blue dashed line on the chart is where the previous 4th wave started and this level corresponds to 7766, which is one possible ending point for this corrective move. Now lets take a closer look at this corrective move. Drilling down to the daily charts, we are interpreting that at this juncture only Wave a and Wave b are complete and Wave c is underway. Since wave c's are normally a five wave structure, we are interpreting the current decline to be incomplete. If so far everything has been Greek and Latin, do not worry. What we have to do with these interpretations and wave labels is right ahead. Using the guidelines and rules of wave principle, the key point for us is that, the bounce from 9961 (Feb 4th) on the Bank Nifty is unlikely to touch 10788 as wave iv cannot overlap into wave i and is very likely to end somewhere between (10453-10756). So what do we do with this information? Once Bank Nifty enters this price zone of 10453-10756, we look to build short positions for the bigger target of 7766 (previous wave 4) or 7200 (where circled wave A would = circled wave C)(Ideally 1/3rd at 10456, 1/3rd at 10600 and 1/3rd at 10750). One can use 10788 itself as a stop but it would be safer to use 11040 as a stop - that is if you are a futures trader. If you are an options trader, one may look to build positions in March 9000 put or the March 9500 put when the Index starts enters zone of 10450-756. Note: All levels mentioned here are Bank Nifty spot levels and not front month or next month futures levels. PS: Make sure you save a copy of this report as this is a pay per view report. PS: This was a premium content and has now been unlocked. Trade set up invalidated on a move above 11040. BF Utilities has had a stellar run from low 100's. Under the Elliott Wave model the current decline from 670 to 490 seems to be a wave iv correction. There is a good probability that the low of Friday, 490 marked the end of wave iv. As can be seen from the chart below, I'm interpreting this wave iv as a sub-wave of a large wave 3. Hence, if we are seeing the beginning of wave v of Wave 3, we are likely to see BF Utility rise to atleast 824 (typical wave v ending point) and ideally 895, as wave iii was normal and wave v would extend. Eventually, the larger wave 5 would send this stock to north of 1100. Hence, I would look to create go long on BFUtility, 1/3 to 2/3 of my normal trading size at current levels (530) and look for 895. In the event wave iv is still ongoing, I would look to add balance closer to 490 and 460. Once we see a cross above 620, we can be confident that the move to 895-1100 is underway. I will email you through updates as to where to place your stop loss orders but at the moment, I do not see BF utility dropping below 460. Disclosure: I have earlier recommended this to my clients as a multibagger around 300 levels for a target of 1300. 536 CMP. LIMIT UP. If you stuck to the original idea, we are currently sitting on a profit of 10%, if you added more during the decline to 431 as per email of 17th, a slighthly higher MTM profit. I suggest booking 1/3 of the qty now. When the stock crosses 605, you can add back this 1/3rd. OR stay in the trade for the rest of the ride with 2/3rd of your position - its all up to you. Remember, always play extreme defence, the profits will roll in. was only when the stock crossed 605-20. Please re-read the original post. bottom is formed. How you manage your risk is in your hands. Gold corrected as expected from 1270's to 1248 and once again bounced from 1248 to 1270. Part of the trade idea was to go long on a just -OTM put. After the report was published, PNB's 560 put appreciated from 5 to 42, 580 put appreciated from 10 to 62 , 8 fold increase and 6 fold increase depending on which strike was taken. Both these posts - PNB and precious metals have useful trend guidance that can come in handy for the slightly longer term trader (albeit at a higher risk level now). If you would like to know what are the decision points (targets, key levels, stop loss) and where these securities are headed, click the purchase button( click here for PNB and here for Gold and Silver key words -credit/debit cards and paypal accepted). The weekly chart of Gold with its Elliott Wave labelling is shown below. Gold is moving within a large complex 4th wave and the final 'Y' leg of the 4th wave may have just started. Besides the June low of 1181, a couple of important Fibonacci support clusters are placed around 1180's. Also, on the day when Gold hit a low of 1186, a survey of futures traders who were bullish on Gold was a mere 5% - an extreme and market lows tend to occur around such sentiment extremes. Therefore, the odds that Gold has seen an important low at the level of 1181 is quite high. Hence a short term trader may look to go long on Gold with a stop below $1180. Partial longs at current price and pullbacks around 1217-1210 to be used as further entry points. The wave Y is very likely to end close to the August high of Gold, roughly around 1425-30 and that will be the price objective of this trade set up. The technical structure of Silver is similar to that of Gold. Silver is moving within a large complex 4th wave and the final 'Y' leg of the 4th wave may have just started. Silver is unlikely to drop below the low of $18.6 seen last week. 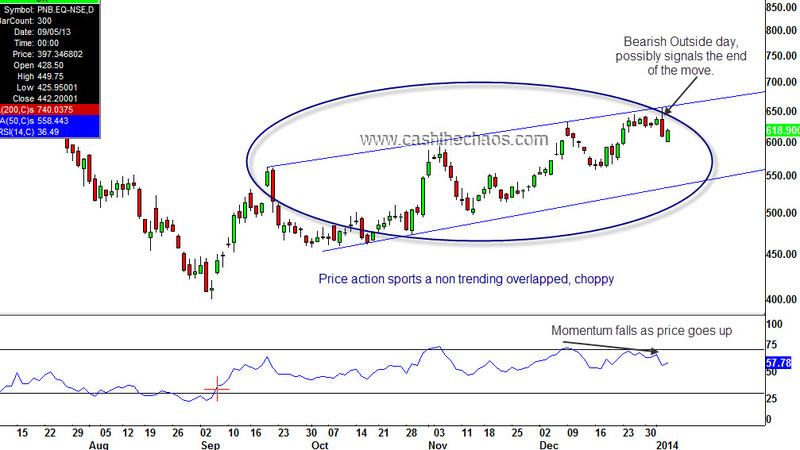 Hence traders may go long with a stop below 18.6 with a price objective of $25.2. Use decline to $19.7 and $19.5 as entry points with a small entry at current price of $20.2. PS: There are legitimate alternate Wave Counts for both Gold and Silver but the alternates also point to a short term rally. Mr Market will tell us if we need readjust our wave counts. As of now even the least bullish case, points to a rally of $1350-60 for Gold. PS: This was a premium digital content and has been unlocked now. PNB has gained about 19% since the beginning of December. However, the rise from the September low seems to be just a corrective rise within a larger decline. The monthly chart of PNB shown below sports a distinctive lower low and lower high pattern. 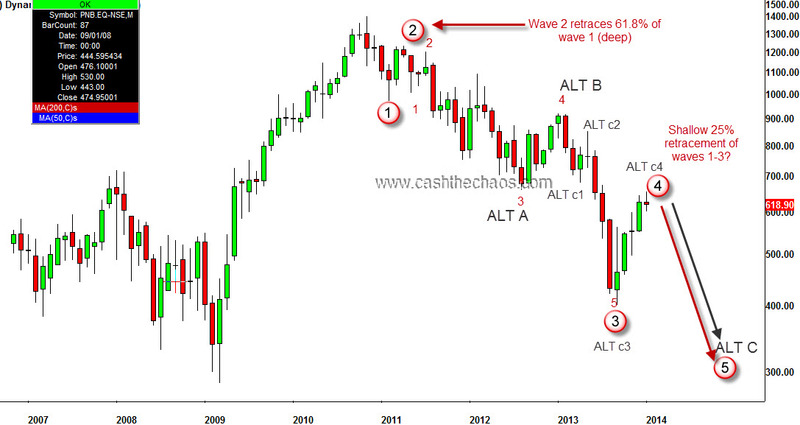 From an Elliott Wave perspective, the decline from 2010 to 2013 September can be counted as waves 1 through 3. On 2nd Jan the stock reached 654 and then fell sharply to register a bearish outside day. This level of 654 is a perfect 25% retracement of waves 1 through 3 which is a characteristic behavior of wave 4 after a strong wave 3. On the daily time frame, the move since September is slow, choppy, overlapping, contained within parallel lines - once again a characteristic behavior of a corrective rally. Now if we see PNB drop below 600, it is likely that the 5th wave down has started for PNB and a decline to a minimum of 400 is underway. The confidence in this wave count will increase if PNB closes below 558 and also breaks the parallel channel. So, what would I do as a trader? IF and ONLY if 600 is violated, I would consider going short with 682 cash level as a stop. Ideally using some just out of the money put (should be liquid and have a sensible premium) as a trading vehicle. After, 558 is taken out, I would consider getting more aggressive and hold for the medium term target of 375. If however 654 is taken out before 600, the broader theme of a 5th wave decline would still be valid but I will let the upward correction continue to about 680-721 before looking to go short. (I will email you all and update in this scenario). The bottom line - medium term outlook is bearish and a move below the September 2013 low seems likely. Legal Disclaimer: This post gives an idea of how a trader chooses low risk entry points for trading and hence what you see in this post is for educational purpose only. This is no solicitation to buy or sell securities. I'm not a registered investment advisor and if you decide to take action on the above idea, you are agreeing that you take full responsibility for the profit or loss that you may sustain based on such decisions and agreeing to indemnify the author of the same. You may have seen me on TV suggesting successful trade ideas but remember trading is inherently risky and past performance is no guarantee of future outcome. PS: This was a premium digital content and has been unlocked. The trade setup resulted in partial profit taking on 31st Jan and balance position was stopped at cost on 6th March 2014. Sun pharma has been the best performing stock in the Nifty index for the last 5 years and the trend still seems to be going strong. The stock is making consistent higher high and higher lows. At the recent low of 562, the stock may have completed a minor wave 4 under the Elliott wave model and a trendline from the year low also passes just below that. With today's 4% move, the stock is looking like it has started its 5th wave up. So, it makes enormous sense to place a stop below 560-555 (on a daily closing basis) and go long on this stock. 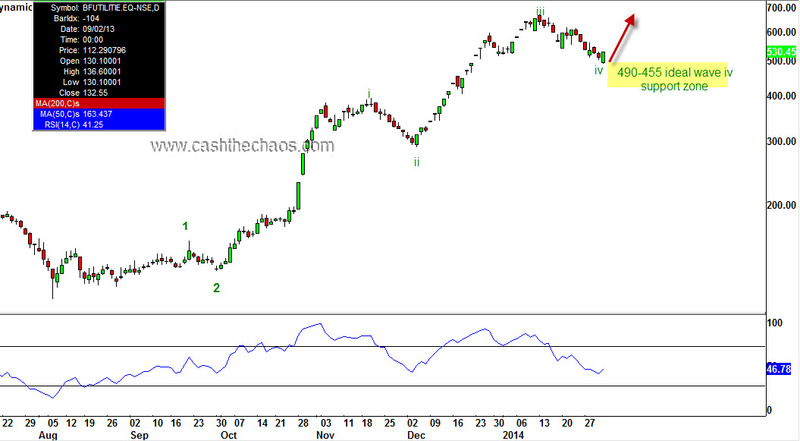 If the wave count is correct, we should see Sun Pharma clock at least 650-674 in the next 2-8 weeks. If for some reason, the stock drops below 555 on a closing basis, we are wrong and will have to exit the trade at a loss.